헤라 클 리온 - 헤라 클 리온에 위치한 객실. 헤라 클 리온의 지도, 헤라 클 리온에 위치한 객실에 대한 사진 및 리뷰. 헤라 클 리온에 호스텔, 저렴한 호텔, 아파트, 게스트 하우스, B & B를 찾고 계십니까? 헤라 클 리온의 모든 최고의 가격은 kr.Dorms.com안에 있습니다. 매달 수천명의 여행자들이 이곳에서 예약을 진행하시듯이 고객님도 헤라 클 리온의 저렴한 가격에의 호스텔을 안전하게 예약하실 수 있습니다. 웹사이트에 고객님이 원하시는 핫 트렌디 시내 주변의 호스텔을 쉽게 찾을 수 있으며, 대학가, 기차역, 공항, 모든 헤라 클 리온의 관광명소에서 가까운 호스텔을 찾을 수 있습니다. 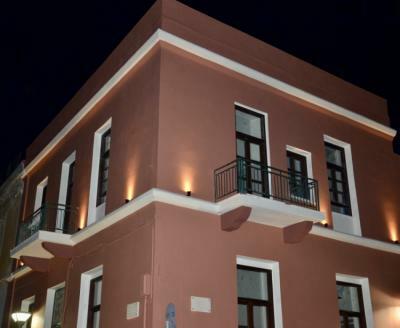 Intra Muros Hostel is ideally located in the most interesting and historical area of Heraklion, ‘Lakkos’, which was the centre of the ‘rebetiko’ lifestyle during the early 20th century. The hostel itself is a renovated 100+ year old stone-built Neo-Classical building, within a short walking distance to all major attractions and interesting spots of the city, next to the city's historical sights, main attractions, nightlife & shopping area. Bars, cafes, supermarket & tourist points all near by. great people, good location, cozy, good vibes, fun times! beautiful hostel. Clean. Great people. comfortable. Good price.